There are many bizarre festivals and activities which take place across the globe. Although some are amazingly appealing, others are just plain weird. If you thought that you've seen enough, hold your breath, as Russia brings you one of the strangest championships of them all — “Male Slapping Championship. 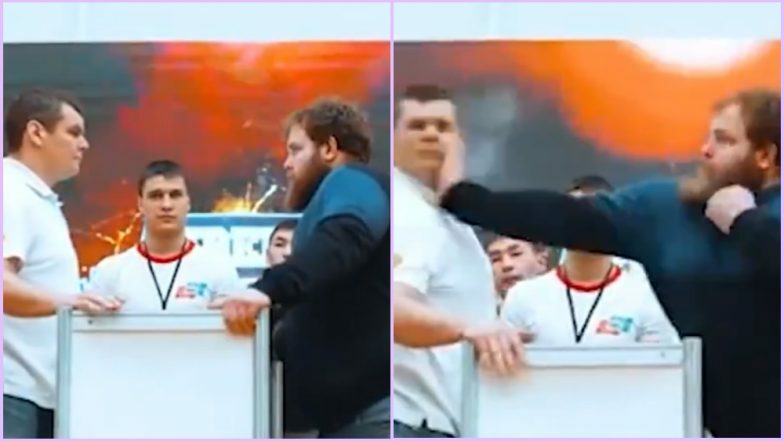 As bizarre it may sound, the Slapping Champion of 2019 took place in Siberia’s Krasnoyarsk society, and it received 466 dollars (approximately Rs 32,147). The videos are going viral featuring the men hitting each other hard AF. Man’s 6-Hour-Long Erection After Drinking Viagra-Infused Energy Drink Prompts Zambia to Ban the Beverage. The bizarre Man Slapping Championship was reportedly conducted as part of the Siberian Power Show — a two-day festivity that featured, “mass wrestling” matches. A large group of male participants gathered to slap, be slapped and watch others getting slapped. The competition is exactly like it sounds — absolutely brutal. Nearly every man who dared step up to the man in the blue sweater, identified as Vasily Kamotsky, had to have someone standing behind him to hold after getting tightly slapped. Bikini-clad Texas Student Climbs Flagpole at South Padre Island Spring Break, Falls Off Immediately. Kamotsky was declared the slapping champion. Below are the videos capturing some of the best hits and knockouts from the event. The slapping championship takes place in many parts of Russia and has been going on for many years now. It is considered to be the most brutal competition in the world. Unilad reported that participants of the slapping championship are neither athletes nor do they have any skills or techniques, unlike boxing. They are just people who like to slap each other really hard. Hence, there is no ‘sportsmanship’ involved. In 2018, a similar competition took place during the Sarychev Power Expo in Moscow where a man named Yuriy Kuzmin was declared the ‘King of Slappers’ after he competed with many people for three hours.